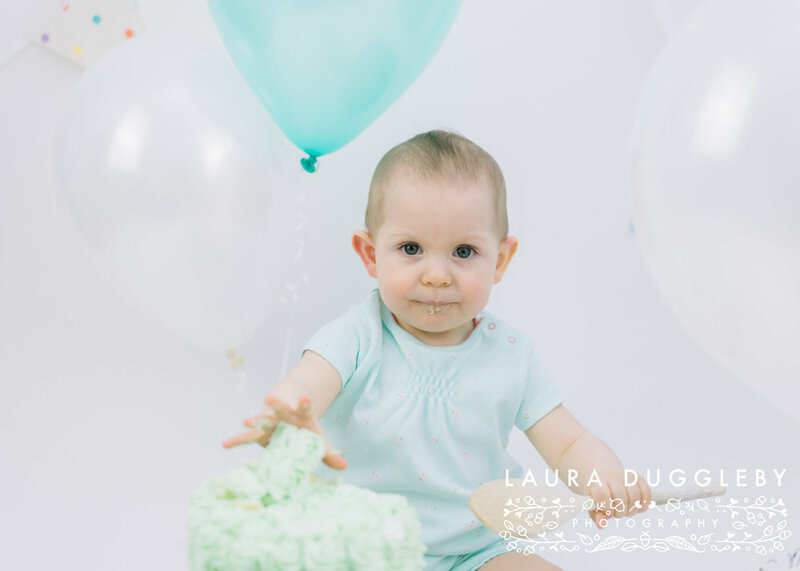 Cake Smash Photographer Lancashire - Meet Sofia!! Cake smash and splash photographer in Rossendale, Lancashire! 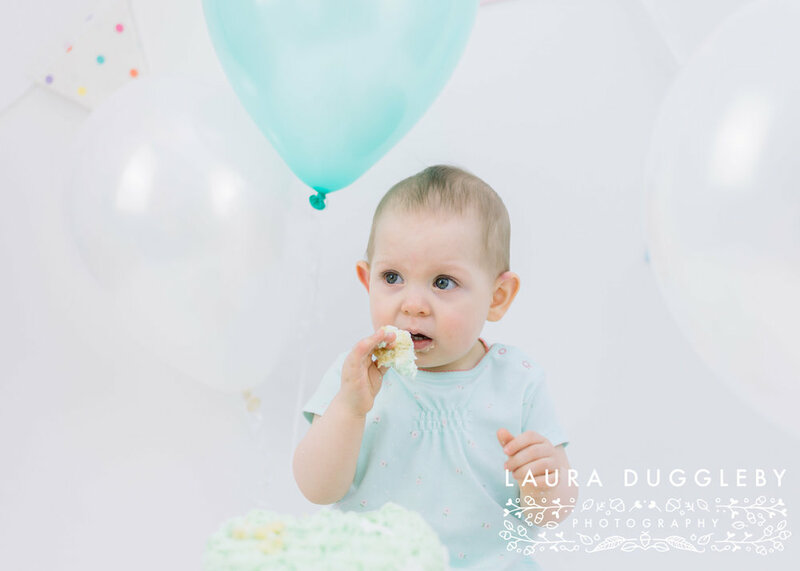 Vintage style Cath Kitson bunting, mint greens and white balloons were the perfect backdrop for Sofia's cake smash session!! I always do cake smashes and splashes at my home studio in Helmshore, Rossendale. I just love the expressions all little ones show when they have their sessions, generally they dig in, on the day Sofia wasn't as keen as some children, this sometimes happens and is nothing to worry about! With a little encouragement from me and her mum, Nicola she soon started to eat the cake and play with the balloons!! 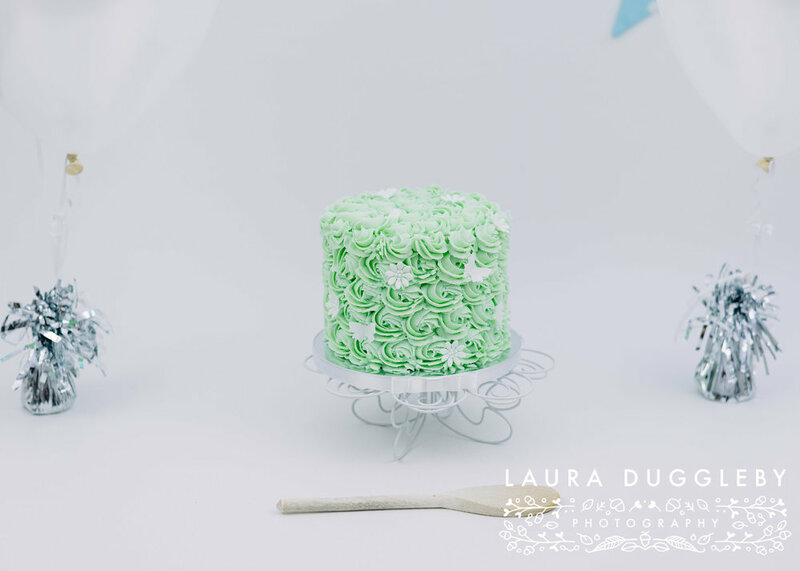 Sofia's cake was a beautiful large cupcake style cake made up of delicious vanilla sponge and dressed with mint green rosette buttercream. It was lovingly made by Joan from Jaybee Cakes. Joan is a local cake maker and I always try and get her to make all my cake smash cakes. The cakes always look to good to eat, for Sofia's cake smash I was actually able to try the cake and it really was delicious!! Normally after a cake smash, comes the 'splash', however Sofia really isn't keen on water so for this cake smash session, the 'splash' part was skipped. I really enjoyed this session, below are some of my favourite images.